It always starts the same way, usually on a Monday. In fact, I’ve come to expect them so much that I can take bets on when they arrive and feel comfortable that I’d win nearly every time. It’s the “Thank You” email following a weekend of teaching my workshop. 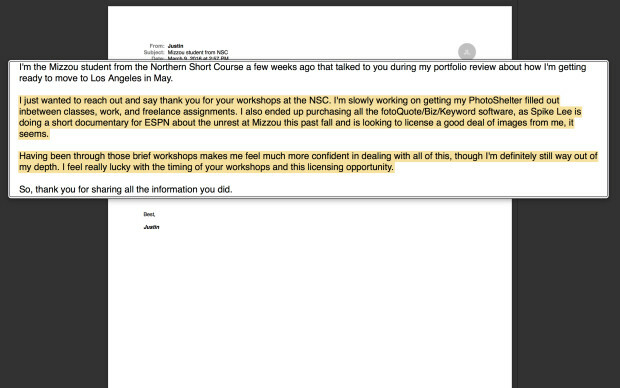 At first they were a pleasure to receive, an acknowledgment that I’d actually made some impact on a student. An ego boost! What photographer doesn’t like a boost to the ego? But as they became more common, I started to interpret them differently. Sure, they were thanking me, but if I went past that and delved further into why they were thanking me, the email took on significant new meaning. You see, students were thanking me because the educational system was failing them. That, I’m sorry to say, is inexcusable. As good as a simple “thank you” should feel to receive, it doesn’t any longer. They’re thanking me because their universities, with a few notable exceptions, are essentially ignoring the need to teach these photo students the business skills vital to survival in the freelance world. The seriousness can’t be overstated. Once they’ve flipped their tassel to the other side and walked out the arches of their esteemed universities, these newly minted photographers will almost immediately deal with complex contracts issued by lawyers at large media companies, navigate copyright issues, struggle to understand various tax issues and make important client development decisions to name just a few. Failure to make the right decisions early on can not only impact career choices in the future, but lead to legal problems. Take the example of a freelancer signing a Work For Hire agreement without understanding that the contract transfers ownership of the image to the assignor. Say the photographer then creates an iconic image on assignment. Think that can’t happen? It certainly can, especially when Work For Hire agreements are commonly offered to young photographers looking to earn their stripes at wire services and newspapers. What’s keeping the universities from providing students these new tools for the modern world of photography/photojournalism? Why are photography graduates entering the workforce with strong skill sets but no business sense when the US Census Bureau stated clearly in 2012 that 60% of photographers were freelance? Given the continued contraction of the newspaper and magazine industries, that percentage is certainly higher now than four years ago, yet little is being done to prepare the students to freelance. Why? Well, first off, anyone who has spent time in a curriculum meeting or served within the walls of a higher educational institution knows that fundamental change comes at a pace that is slightly slower than global warming. Studies are required, changes noted and debated and revisions considered by committees, departments, the college, the university as a whole and all with consideration to the accrediting institution. In other words, change can come, no doubt, but at a pace that results in remaining behind the curve while the profession rapidly evolves. That being said, the photography/photojournalism profession has been in contraction for a decade or more which has swelled the ranks of freelancers who once served on wire, newspaper and magazine staffs. A decade is plenty enough time to see the writing on the wall and change curriculums to incorporate freelancing essentials. The universities and colleges need to ensure students are not sent out into the world blind to what awaits them as independent photographers. Unfortunately for the students, the “light bulb moment” comes when they take my workshop (or others geared toward freelance business practices) and realize they were short changed on a major scale. Although moving at a snails pace when it comes to change within the universities is troubling enough, it’s not the sole factor in why the next generation of highly skilled photographers are frustrated when entering the freelance world. Consider the overweighted significance of degrees on who is in the classrooms preparing the students for their careers. In most states, including California where I teach part time (currently teaching and Advanced Lighting & Freelance Business Practices, a hybrid course I developed for my alma mater), a terminal degree, such as a MFA, is required to be hired as a tenured professor. The vast majority of professors whom I know have terminal degrees and have been teaching photography and photojournalism for many years. That’s great, but have these professors experienced the digital revolution that has resulted in the profession’s transformation to a freelance based industry from a staff based industry in place when many professors entered the classroom? 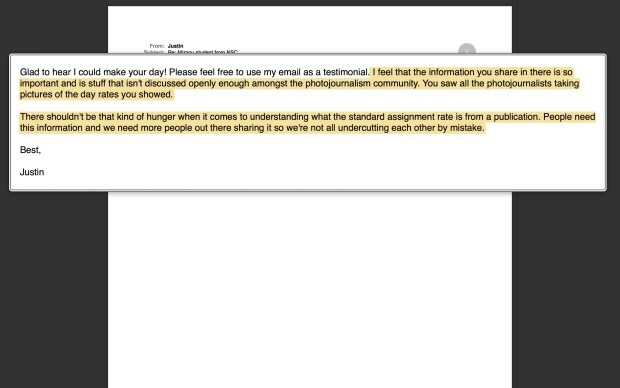 Have the professors entrusted with instructing the students gained enough experience in analyzing photo contracts in an era where corporate media companies want to strip freelancers of image rights? Or do professors have enough experience to speak to the need to create and sustain licensing revenue? Do the professors understand the significance of developing a diversified client base or creating a efficient workflow to serve clients, agencies and copyright needs? For the most part, the answer is no, and I know this because I get the Monday Emails in addition to the many talks I’ve had with my workshop students. Obviously, I’m not so naive as to think that universities will quash the requirement for terminal degrees to teach as a tenured professor, but it would go a long way in serving students if universities searched for new and innovative ways to bring members of the profession with timely, practical skills into the classroom to better prepare the students for a sustainable career. The professionals actually working in the business can bring new insight to the students so they are better prepared to enter a profession that is still in rapid change. Take for instance what the University of Texas, Austin did to ensure the magnificent Eli Reed could teach their students. Mr Reed is a man of few peers and a long standing member of Magnum Photos who has produced a body of work that will enthrall any photographer. Yet Mr Reed never obtained degrees from institutionalized higher education, choosing instead to earn his Phd, so-to-speak, by actually getting into the field and producing amazing work. UT Austin honored Mr Reed with a Clinical Professorship, a well earned honor, and now all the students who come through that program not only gain insight into his photography, but they are learning from a working photographer! But universities have to want to change if there is any hope of creating a curriculum for students to learn freelance business skills while earning a degree. The onus should not be placed on students already burdened with student debt to seek additional education outside the university when the information is vital to success in photography/photojournalism. In other words, change will only come once the universities realize they are leaving students with insufficient skills to create, grow and sustain a career. Providing instruction in developing creative skill is vitally significant, but it’s simply not enough any more. Failure for universities to evolve to meet the demands of the evolving photography profession is simply unacceptable. It’s time for change. Let’s hope change happens soon because I’d love to never receive another Monday email thanking me for the information. Can change actually happen? I think so…………..
As my mother was fond of saying, it’s not sufficient to identify a problem, you should always seek a solution. With that in mind, there are several things that can be done to begin the process of better serving the country’s future photojournalists. It may be obvious, but it must also be stated. Until the photo programs actually acknowledge that they are not giving students the necessary tools to handle self-employment as a photographer, there will never be a move to find solutions. Photojournalism programs should initiate research studies to track graduates at one, two and three year intervals to gauge the effectiveness of their programs. Merely keeping in touch is insufficient as real data will reveal a wealth of information that can then be used to further evolve the curriculum to assure graduates are receiving relevant and practical training. Are the graduates working as photojournalists or photographers? Are the graduates staff or freelance photographers? What is the graduate’s annual income? Are the graduates relying on financial assistance from family or friends? Are the graduates able to meet their student debt obligations? Have the graduates advanced in the profession? If freelance, how much time do the graduates spend trying to develop clients? If freelance, are they able to clearly understand contracts that deal with legal issues such as copyright, tax obligations and indemnification? With experience derived from the profession, what education would the graduate like to receive if they were still enrolled? Most will say that any solution which includes words such as “increase budget” is dead on delivery. But that’s part of the problem. Higher education needs to realize the vital significance of teaching courses emphasizing contract law, client building, archival management, marketing and 1099 tax issues to name just a few. Can you guess how many of my workshop students with degrees have no idea what the difference between a 1099 and a W2 is? Or that they pay a self-employment tax? I’ve worked as an adjunct for many years and enjoy it. But the reality is adjunct work typically doesn’t pay that well and certainly not on the scale of what a tenured professor earns. Yet the adjunct is often the one with the real, timely and practical experience from which the students will gain invaluable knowledge, but many don’t possess the required post graduate degrees. Universities need to loosen the restrictions on degrees and evolve the “equivalency exception,” as it is known in academia, in a drive to put working professionals into their programs. Professors who have not worked through the incredible transformation the industry has had in the past ten years can still offer wonderful instruction, but universities have to find a way to supplement that with education that reflects the reality of today’s freelance dominated profession. While I think it’s important to create courses designed specifically within the photography major which addresses the topics previously mentioned, I realize it might not be an option for some cash strapped public universities. But, departments can work together to create a major which mandates students pass courses in business management, finance, accounting etc so at the very least photography students learn the basics of business. It’s a step in the right direction. In the course of the past week this commentary has been viewed thousands of times and I’ve received many replies on social media by students and adjunct professors. The point is truly not about my workshop. It’s about the students. As I said above, I see my son, a college sophomore working very hard to gain the knowledge necessary to succeed in his field of study, in every one of the workshop students. Therefore, I feel frustrated when students email me that they aren’t getting this information while enrolled. Why? It is SO relevant to their success and to their ability to actually pay the student loans they took out to attend the university in the first place! I received another email yesterday and am posting them here with permission. 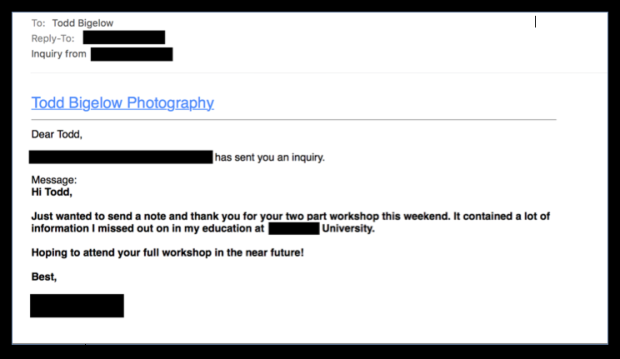 Again, I’m very happy to hear that my workshop is proving helpful to these young photographers, but can’t you hear the frustration in this student’s email? He sat through several hours of presentations at the NPPA Northern Short Course and walked away with a better understanding of what is necessary to succeed in freelance photography, particularly photojournalism. Before he’s even graduated, he is valuing his work and looking to license important images he made to Spike Lee for an upcoming documentary. It took me more than ten years of constant egging to get my department of photography, at the University of Westminster, to run a module specifically to prepare students for their professional life. The main objection: the content was insufficiently academic for a 3rd year module. I think the real reason was that non of the senior staff had ever, I repeat EVER, worked in a sustained way as professional photographers. I had. The first full-time high-calibre pros were brought in to teach entire modules (not just parachute in for a talk) were recruited by me. These academics are good at producing graduates who are good for only one thing: working at university. I wanted one module each of their three years, but no; that’s too much professional preparation. I cheated by creating modules with as much business content as I could, such as one on publishing. Eventually, I was asked to write up the module to be run on the final semester. Most common reaction of students at the first classes: Why didn’t we get this earlier?